My crooked knife blade (Christmas present) finally arrived and I couldn’t wait to put the handle on to it. I went into the woods with only my laplander saw and my mora knife, as I didnt have my axe here. I found a piece of olive wood, which is an extremely hard wood, that I had used half a year ago to carve a spoon. I cut it into size, removed the rotten outside and started carving; all of this I did without yet having the blade with me. As woods here in southern Spain tend to be harder, I thought the thumb support would be essential, and as I was carving it I realised that it was starting to look like a bird’s head, so I decided to fashion it in this way. The engravings I did with a lense, something I had tried before on a walking stick, and I thought I’d finish it with some olive oil, rather than other more appropriate oils for woods, as it was the natural oil that this wood would originally contain: it was a success. I would recommend anyone thinking about buying a crooked knife to give it a try; the handle was actually easier to make than I first thought, I mean it fits in surprisingly well. There’s also a video at YouTube called “making a crook knife” (parts 3 and 4 are about the handle) which really helped. Anyway, I’m really happy about this tool, even though at the beginning I thought maybe 80 euros would be too much for a blade, I already gave it a try and it is a superb piece of kit. 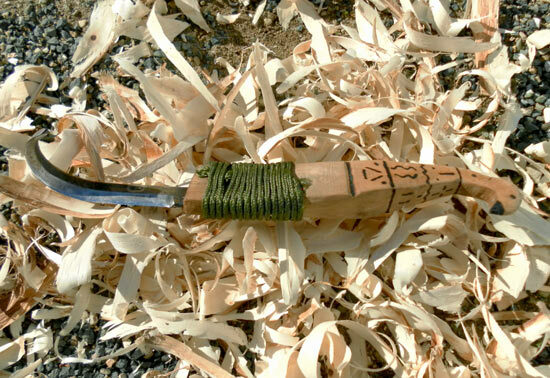 This entry was posted in Bushcraft Clothing & Equipment, Customer Posts on February 16, 2011 by Woodlore Team. I’m a German friend of Roge and I saw that masterpiece. I visited him in south Spain recently. The picture above is great, but it even looks more impressive in reality. It’s not too big, so you can use it perfectly. – Although he is young, he’s really creative and knows a lot about nature. Great job on the handle Rogelio, Muy Bien!